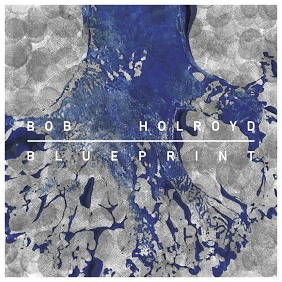 Having been a fan of Bob Holroyd for over two decades starting with Fluidity and Structure way back in 1993 I am very happy to see that Bob is still releasing great music all these years later. The music business in the last decade or so has not been the most hospitable to the very artists that fuel the business with their creative endeavors so it is always a good sign when artists that you have come to respect over decades of releases are still putting themselves out there with new music instead of giving up, taking a day job and keeping their musical compositions for themselves on a hard drive somewhere. Blueprint is Bob’s latest album which came out on November 1st last year and while you might have a certain opinion of what could be contained on this release based on what Bob has done in the past you would probably be wrong because as usual Bob Holroyd’s music is anything but typical and he is always pushing past the boundaries of what has come to be called ambient music into new and unexplored areas. Blueprint is a wonderful album that moves fluidly between styles as diverse as ambient and jazz but does so in such a way that you will believe that they have always been the same genre of music sort of like twin sons of different mothers to steal the title of an old album by Fogelberg and Weisberg who at the time seemed highly unlikely to release an album together. Folk and jazz. But as Jeff Oster and Mark Isham have shown in the past trumpets and ambient music flow together quite nicely and now Bob Holroyd joins that club as well. The music is an eclectic blend of styles and shows very well exactly what Mr. Holroyd is capable of as a musician and a composer. It is easy to see how a song like On Saying Goodbye which is a somber, melancholy song featuring what sounds like cellos and other stringed instruments can stand alongside a song called Sometimes which is a jazz tinged song with an excellent smoky club trumpet part, a vivid guitar part that wafts over the song from a lofty high point and a drum line that keeps things moving steadily forward. If you really want to appreciate this song just set it on repeat and take it in for several plays and I’m sure you will agree that it is one of the standout tracks on this album. And yet as you listen to this release as a whole the two aforementioned songs seem right at home together because that was Bob’s intention with the compositions that were created for this album. The songs were all meant to be progressions of a basic theme and yet the core of those progression is what remains an integral part of each song as it evolves through all the iterations and diversifications on this project. It is this core that takes these seemingly different musical themes and brings them together as a creation that consists of many parts but is really only one body. Another sonic delight that I have listened to repeatedly is a song called Flow which features simple synth tones to start the song off that simply echoes as the notes drift gently by building little by little until the other elements of the composition begin to be heard. These other elements include another quiet and alluring part for the trumpet as well as strings that take center stage as the song develops all the while with the original tones keeping pace with the composition while different elements step up for their turn in the spotlight. It is a very simple composition in a sense but in the hands of a musician of Bob Holroyd’s stature this simple melody line becomes something that will draw a listener back to it again and again. It is very difficult to even think about choosing favorite songs from a collection such as this since each song plays a part of the whole work and to think that you can say that any part of the whole is better than any other part of the whole would simply not be right on my part. The best thing a listener can do is to simply sit down with the album to either listen to it actively or to leave it on in the background for multiple plays so that the music seeps into your consciousness over time at which time you will be surprised at how these diversified tracks start to become a living breathing whole organism right before your very eyes or in this case right before your very ears. Bob has offered us an outstanding piece of work with Blueprint that is polished to perfection with sound quality that is flawless throughout. This album represents a captivating narrative set to music that Mr. Holroyd wants to share with those who are open enough to walk that path with him. I for one will be adding this album to my rotation for quite some time to come.